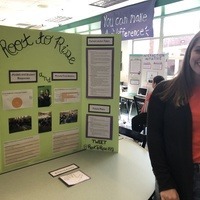 Students at Flagler Palm Coast High School, Florida, USA, are feeling less stressed thanks to yoga devotee Ekatereena Kouzina. The IB Diploma Programme (DP) student has set up weekly yoga sessions as part of her Creativity, Activity, Service (CAS) project. Ekatereena has had a great response from students who say they feel more relaxed and better able to focus in class. After the first DP yoga session in January, Ekatereena conducted a survey and found that 85% felt less stressed with the remaining 15% being unsure. However, the number has now risen to 100% of students saying they are less stressed. The project has helped Ekatereena to develop IB learner profile attributes. I have become more knowledgeable, caring and risk-taking. Yoga is not accepted by everyone and asking administration to allow teachers to shorten their class time is risky,” she says.